Since I am my own tech support for this lecturecasting process, I need to make it as easy and streamlined as possible. It also needs to be cheap, since I’m self-funding this with my generous adjunct faculty salary. 🙂 In this post, I’ll describe some of my personal history and knowledge of lecturecasting systems, and detail how I’m using my MacBook Pro laptop, free software and websites, and an $8 per month PRO account on blip.tv to accomplish the aforementioned goals for T4T this term. Our week 1 lecturecast is now available on our T4T Scribe blog, and future episodes are set to auto-post there from blip.tv. Our T4T blip channel is t4t.blip.tv. Gloriously, that website auto-detects if visitors are using a mobile browser like Safari on an iPhone or iPod Touch, and will serve up compatible H.264 QuickTime video to view on the go without any syncing to iTunes required. (Wifi or 3G connectivity is best for this type of mobile web streaming.) 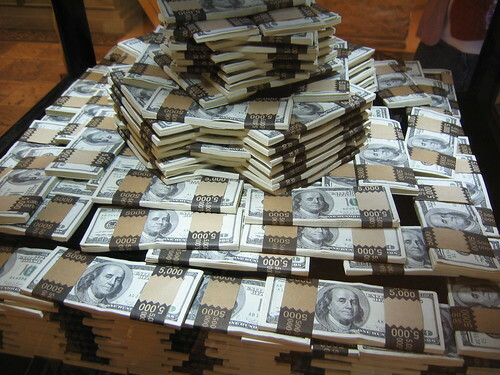 All for $8 per month! When I served as the director of distance learning for the College of Education at Texas Tech University from 2001 – 2006, I was amazed to see the improvements in videoconferencing and web streaming which took place in the industry. During that time, we went from using virus-prone Windows95-based videoconferencing systems to H.323 videoconferencing units interfaced to a state-of-the-art Codian IP VCR. My June 2006 post, “Kudos for Codian,” gives some additional background about those technologies. Codian has since been purchased by Tandberg, and their amazingly responsive technologies are now integrated into Tandberg products. I think every college lecture should be recorded and made publicly available. If it’s worth sharing face-to-face, it’s worth recording. After all, we need to start treating digital storage as abundant, right?! We also need to keep in mind the point made SMU Art Dean Jose Bowen: Professors and instructors MUST STOP PowerPointing students to death! He was quoted in a Chronicle of Higher Education article last year originally published with the headline, “‘Teach Naked’ Effort Strips Computers From Classrooms,” and later changed to, “When Computers Leave Classrooms, So Does Boredom.” IMHO, that was a terrible headline re-write. It should have been something like, “Dean Exhorts Faculty to Stop Technology Abuse.” It takes a good teacher with good learning strategies to evict boredom from a classroom. Boredom can be present with or without technology. The amount of content available in Apple’s iTunes U is amazing, and I know it’s just going to grow in the years ahead. MIT Open Courseware probably sets the bar for the OCW (open courseware) movement, but there are a growing number of other institutions also getting on board. Here’s the problem with scaled lecturecasting for instructors as well as institutions: It can cost a LOT of money to purchase and support lecturecasting solutions. I don’t know what current quotes are, but about a year ago when I was helping some educators at UCO evaluate lecturecasting solutions offered by some vendors, they were wanting $10,000 PER CLASSROOM to support lecturecasts. Don’t get me wrong, these systems were and are VERY sophisticated, and can require virtually ZERO instructor / professor technical saavy and intervention to work. If the system is installed with a classroom PC and microphone system, the instructor can simply turn on the microphone and start teaching at the scheduled time class begins. The lecturecasting system can automatically turn on, and start capturing instructor audio along with synchronized slides of the presentation being shared with students. After class is over, an automated script can run which compresses the recorded lecturecast and posts it online, even to a secure portal like WebCT / Blackboard or Moodle. While these commercial lecurecasting systems can be turnkey solutions, they unfortunately can require a mountain of cash to deploy institutionally. These were the procedures I followed today to webcast and make my lecture available on Blip in an iPhone/iPod compatible format. My wireless mic must be plugged into AC power, but the Mobile Pre is powered by its USB connection to the computer. After plugging these peripherals into my MacBook Pro and turning on the lapel mic, I launched Camtwist. Camtwist acts as a video source switcher, and lets you also share your desktop as a video source. I selected my webcam first as the video source. I next launched Ustream in Safari, logged in, and clicked the BROADCAST NOW button after selecting my desired channel. I selected Camtwist as my video source, and Mobile Pre as my audio source. I approved the Ustream site to use my audio and video connections (when the flash-based prompt appeared) and when class started, clicked to start the broadcast and also start a recording. During class I just used my webcam for the initial few minutes of the video. After that, I used Camtwist to share my desktop and kept that as my video source. When class was over, I clicked to end the recording and entered title, description and tag information into Ustream. I clicked to end the Ustream broadcast also. After class, I downloaded the FLV version of the Ustream video to my local hard drive. In June 2009 when I wrote the post, “Downloading and Converting Ustream FLV Videos to DVD,” Ustream had unlinked options at the bottom of each video for WMV, MP4, and MOV versions of videos. I’m not sure what happened, but I don’t think those transcoding options have panned out. Ustream does still display the text “We are currently improving our video conversion features. Check back soon” at the bottom of videos. It is therefore possible a direct MP4 video download may become available at some point, which could render my next steps in making a local conversion unnecessary. It is FANTASTIC Ustream provides some kind of direct download option, even if it is just FLV currently, because that is KEY for this entire process. I like many things about Livestream (a competitor of Ustream), but Livestream does NOT seem to provide ANY type of direct file download as Ustream does, even if you “go pro” and pay for an upgraded account. The download today from Ustream was very fast. The unedited video recording from my first section’s lecture is 01:16:37 (1 hour and 16 minutes) and 102 MB in FLV form from Ustream. Something went wrong with my audio recording during my second class, so I ended up using the first class’ to publish on our T4T Scribe Blog as well as on our week 1 curriculum page. A few weeks ago before the winter holidays, I experimented with uploading a Ustream FLV file directly to Blip.tv and found Blip won’t / can’t transcode it to M4V iPod format or mp3. A pro Blip account gives you the option to transcode uploaded files not only to Flash/flv format, but also to m4v and mp3. In order to make my lecturecasts iPhone accessible on Blip, however, I’d need to convert the file FIRST to another format and THEN upload it to blip. 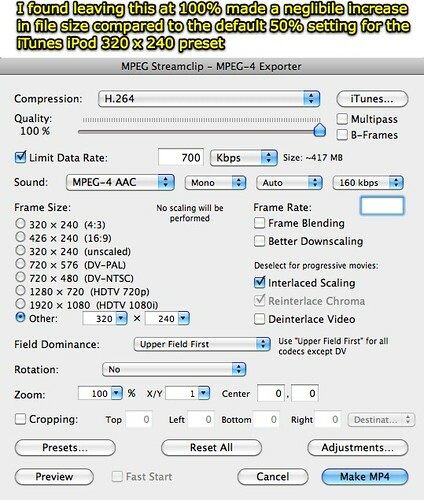 There are a lot of file converters available for Apple computers, but I chose to use MPEG Streamclip in this case for several reasons. First of all, it’s free and cross platform. Second of all, it’s the most flexible, free video converter I know of on the Mac side which can convert FLV files. ffMPEGX can as well, but it doesn’t support easy edits like MPEG Streamclip in my experience. I set my lapel microphone next to the PC speakers as this video played, and that ended up being too loud for my Ustream recording. I therefore needed to edit out that video segment from a technical standpoint. There was a LEGAL requirement for me to edit out that video as well, however. The videos in this series are licensed under a Creative Commons BY-NC-ND License, and if I included the video in my lecturecast I’d be making an unauthorized derivative work. Fortunately, MPEG Streamclip makes it a cinch to edit out video clips like this. I navigated with the playhead to the start of the EduTopia video, pushed the “i” key on my keyboard to mark an IN point, and then dragged the playhead to the end of the EduTopia portion. I pressed the “o” key to mark the out point. From the EDIT menu I chose CUT, and that was it. EduTopia video gone. This also reduced the total time of my lecturecast to 1 hour and 7 minutes. 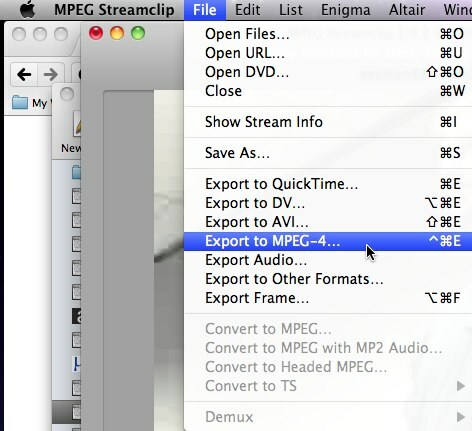 With my minor editing finished, in MPEG Streamclip I next chose FILE – EXPORT TO MPEG-4. On the next screen, where you specify the export settings, I clicked the iTunes link in the upper right corner. 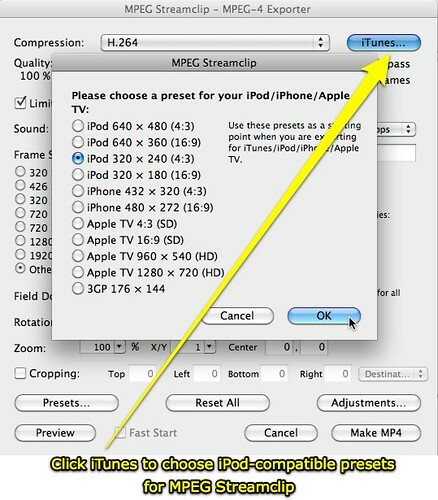 I selected the iPod 320 x 240 resolution option, because that was the saved resolution of my Ustream FLV file and I want iPod compatibility. I experimented with five different export settings today, and the only two changes I ended up going with to those default iPod 320 x 240 settings were to increase the quality slider at the top to 100% and add a watermark to the video. Having the video quality set lower, even down to 50%, didn’t seem to affect the file size much. If I can get better quality with a similar filesize, I figured it was better to go with 100%. I added the watermark for www.powerfulingredients.com by clicking ADJUSTMENTS and then entering that URL. You can’t change the placement of the watermark, apparently, but I think it’s GREAT you can add one at all. It makes the final video look much more professional, I think, and provides some good visibility / marketing for my Powerful Ingredients for Blended Learning writing project with Karen Montgomery. It took just over five minutes to export this final MP4 video. After that export was complete, and I was in a location with high-speed wifi, I uploaded the file to my pro Blip.tv account using the provided browser-based uploader. I added a title, description, and tags, and uploaded a custom episode logo/badge for the date and week of the course too. 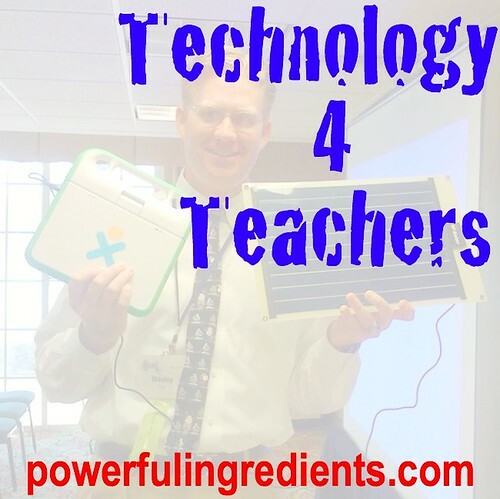 I modified the T4T course badge I created recently with Seashore and a photo from MASSCUE 2008. I know that sounds like a LOT of steps, but relatively speaking I think it’s FAR less than it could be… especially for the price. If you use http://www.procaster.com (It’s part of LiveStream), you can show your webcam and desktop at the same time. It also saves a copy of your .flv locally. I think they just started a Mac beta of their software. Have you looked at using Quicktime in Snow Leopard instead of Ustream? You’d have to record the webcam separately from the desktop, or just record the desktop and throw up Photo Booth when you want to record yourself. I’m going to check out the wireless mic, but musiciansfriend.com doesn’t list the UHF-3, it looks like it’s been replaced with the UHF-4 ($90). I completely agree. My teacher wasn’t able to do that – I wish she had, because she had some great points that I can’t quite quote just right – so I invested in an electronic audio recorder and export the clips to my macbook. Still not the same as sharing it with everyone, but at least i can look back on certain parts that I enjoyed.